- Aynsley, Mikeopenfile. (21 novembre 2011). What the viaducts and Eastern Core could look like. - Aynsley, Mikeopenfile. (29 mai 2012). Vancouver city staff recommends removing the downtown viaducts in latest analysis. - Aynsley, Mikeopenfile. (6 juin 2012). Vancouver publishes detailed concept plan for the downtown viaducts. - Bula, FrancesState of Vancouver (27 novembre 2011). What Vancouver could get from viaducts land: open space, below-market housing, more? - Artibise, YouriYurbanism. (novembre 2011). 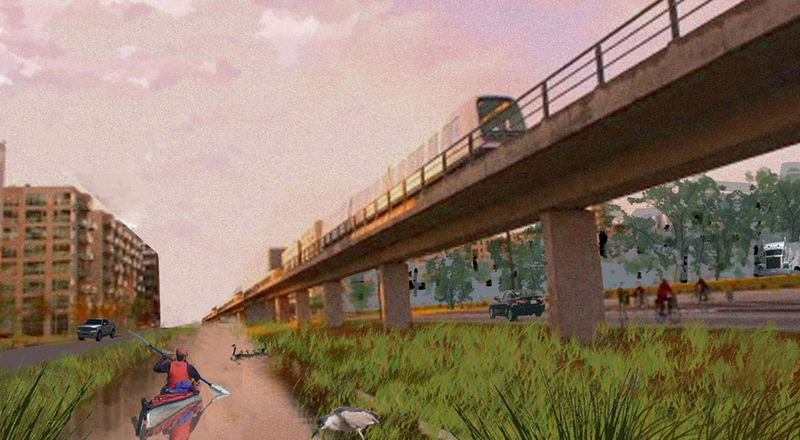 Vote for re:Visualized Versions of Vancouver's Viaducts. -Longhurst, AndyRabble.ca. (19 juillet 2011). Vision Vancouver's re:THINK: Obscuring housing crisis through the spectacle of competition. - JOCJournal of Commerce. (2 décembre 2011). New Vancouver viaduct designs recognized at re:CONNECT competition. - Kitchen, Sean. The Architect's journal. (29 septembre 2011). Re:Connect ideas competition, Vancouver. - Nursall, Kim. The Vancouver Sun. (5 juin 2012). Vancouver to hold first open house on future of viaducts today (with video). - Press releasePublic art online project. (3 octobre 2011). The city of Vancouver announces the launch of re:CONNECT. - Rossi, CherylVancouver courier. (2 décembre 2011). Public, professionals submit ideas for Vancouver viaducts: Winning juried entry envisions pedestrian and bicycle bridges. - Stoymenoff, AlexisVancouver Observer. (23 novemvre 2011). What's your vision for Vancouver's viaducts? Public voting is open until Sunday in the City's competition for new solutions around the viaducts. - Toderian, BrentSpacing Vancouver. (26 octobre 2011). No Freeways, but what about those Viaducts? Re:CONNECT Ideas Competition launched! - VSPNVancouver Public Space Network. (21 novembre 2011). re:CONNECT design competition-vote for your favorite idea. - Werb, Jessica. straight.com. (2 décembre 2011). re:CONNECT viaduct competition winners announced. - W.White, Robert. Vancouver is awesome. (29 septembre 2011). re:CONNECT ideas competition. - Press ReleaseThe Vancouver Observer. (22 septembre 2011) Competition invites new ideas for future of Vancouver's viaducts and Eastern Core. - Press ReleaseThe Architects Journal. (29 septembre 2011). re:CONNECT ideas competition, Vancouver. - TNSTargeted News Service. (22 novembre 2011). People's choice voting begins for ideas competition on viaducts and the Eastern Core. - Business Information GroupeSource Canada Business News Network. (9 janvier 2012). Ideas sought for 1960s viaducts in Vancouver. - Redman, HanahThe Tyee. (6 juin 2012). Public Pores over Plan for Vancouver Without Viaducts. - Gravit-e Technologies24-7 PressRelease. (16 juin 2012). Gravit-e Technologies Completes Website for the City of Vancouver. -Daly, JoeyVancouver Sun. (1 décembre 2011). Commuters need the viaducts.